Inspired by Todd Rundgren’s more melodic side and various things ranging from the 1970s through to the 90s, ‘Smooth Sailing’ isn’t quite as pop-oriented as Pace suggests, but on the occasions it hits, it could be considered alt-pop joy. It takes a little adjustment time before its magic is evident, though: the opening number ‘Everyone Out of The Car’ drops the listener straight in to a bonkers world of stabbed chords, grumbling bass, new wave keys and a jarring vocal that’s perhaps closer to The Psychedelic Furs jamming with They Might Be Giants than the Rundgren or Christopher Cross homages you might be expecting. By the time the pre-chorus shuffles into view – and the vocal subsides – you get the feeling there’s something great beneath the layers and by the time Pace offers a world of huge whoahs during a still chaotic chorus it all starts to make sense. It is pop; it is retro 80s new wave; it is what Mike says it is…at least in a fashion, but the volume and bombast gives everything a more modern feel. It really doesn’t break the listener in gently. Similarly not caring for genre specifics, ‘Service Merchandise’ sounds like the love-child of The Go Team and an 80s synth pop band, or Ric Ocasek experimenting with a pumped bass, twangy guitars and a choir of backing vocals. Huge drums and shamelessly retro ideals aside, it could be considered an acquired taste. Delving further into electro-pop, the short ‘Young & Beautiful’ brings autotune abuse aplenty, but musically has a real drive that borrows bits and bobs from 90s alternative sounds in an experiment that values energy over melodies. It’s the album’s only skipper…but by the time you’ve stopped questioning the motives behind it and actually reached for the button, it’s all over. ‘Senior Statesman’ is a much better proposition all round: as far as four minute retro pop ditties go, it really does draw from some great 70s stock. Weaved around a stabbed piano that’s equally inspired by the Steely Dan debut and classic Andrew Gold, the number gets off to a great start and by the time it sounds like a wall of sound blending those things with a pinch of Rundgren and the knowing wink of The 1957 Tail-Fin Fiasco, there’s so much to love. Since his voice is buried under a selection of effects, Pace seems to have half an idea that his voice isn’t exactly on a par with Donald Fagen’s, but his strident piano style and occasional fascinations with jazzy guitar lines send the number off in style. Similarly ploughing for seventies gold, the spacious ‘Business In Bermuda’ opens with a fantastic electric piano, before dropping into a neo-psychedelic world of woozy vocals, big beats and shimmering guitars. Almost like hearing Mike Viola experimenting with dream pop, it’s somewhat unsettling, yet at the same time, the attention to detail in the layers – the plinking pianos, the gorgeous lead bass linking everything and eventually the Skunk Baxter-ish lead guitar uncovers musical joy after musical joy. …And by the time Mike’s acquired taste of a voice reveals itself to be the long lost cousin of Polyphonic Spree’s Tim DeLaughter, the penny truly drops. It isn’t quite as majestic as ‘Senior Statesman’, but it’s definitely a stand out track. A throwback to the previous album, ‘Blaster’ opts for a jangling indie rock workout. The guitar tones are of the Buffalo Tom school of playing, while a slightly shoutier chorus is, understandably, better suited to the vocal. 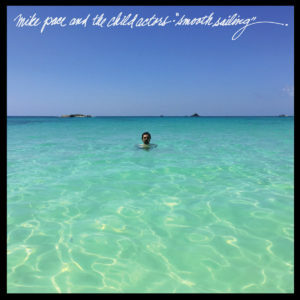 In direct comparison to previous Child Actors tunes, it’s one of the best, but as part of this album of very different moods, it feels a little out of place, while ‘Escape The Noise’ almost feels like Weezer teasing with mechanical rhythms at the outset, before exploding into a slab of 90s styled rock that is very natural. You’ll find better hooks elsewhere, but in terms of overall enjoyment, there’s a lot to like here, especially once the track hits its stride with increased volume, bells and occasional plinking sounds. ‘Smooth Sailing’ certainly features more distinctive tracks, but this one has half a chance of becoming a favourite, especially if you still listen to Sebadoh and Tobin Sprout. ‘Troubleshooting’ works a similar jangle into something more interesting, beginning with multi-layered acoustic guitars and quickly ushering in a heavy drum beat. Looking beyond the 90s rhythms, there’s a quieter instrumental passage that teases with the kind of melodies that could be an old television theme tune, whilst a more forthright vocal is balanced out by ringing bells. A number of at least three different moods, it’s to Pace’s credit that he’s managed to make them seem to fit so naturally. Another highlight, ‘Disconnected Heart’ unveils a crisp and simple but beautifully played acoustic motif, under which the vocal sweeps and echoes in a way that you’d expect Pace had spent time listening to Chris Bell and Elliot Smith during the making of this album. The addition of soft keys to appropriate strings is a subtle but welcome addition, but it’s with the belated presence of a retro sounding electric guitar that the magic in the soft melody really comes alive. In terms of semi-acoustic works, this mightn’t break the mould, but it’s lovely; it shows an emotional fragility that’s quite unexpected. In a final change of mood, the album closes with a sprawling instrumental, ‘Americana Manhasset’ where Pace dips into various keyboard sounds, creating a backdrop that entertains with light electronica colliding with huge indie rock beats, as if Death Cab For Cutie intruded on a Vangelis piece. It’s an unexpected ending, but somehow feels natural, especially as the sounds evoke the ocean view chosen for the artwork. It really accentuates the varied talents that make up ‘Smooth Sailing’ and while a rousing finish would have been amazing – perhaps discovering that Mike is a huge Sparks fan, for example – it allows time for reflection before pushing the repeat button. On ‘Smooth Sailing’, Pace has been unafraid to cast his net wide for compositional influence. That, of course, means that it could be pitching itself at two different crowds: the Superchunk styled indie tracks are good, but it’s when stretching for retro pop things work out for the best, with tracks that deserve to be heard by fans of Mike Viola and Mark Lane. ‘Smooth Sailing’ isn’t that smooth, but if it doesn’t click with you straight out, persevere – it’s worth it. This entry was posted in Album & EP Reviews and tagged indie, mike pace, power pop, singer songwriter by Real Gone. Bookmark the permalink.